Breast cancer survivor Marianne McDonough remembers the exact time and date she learned she had invasive ductal carcinoma: “On Monday, March 12, 2012, at 9:00 a.m.…my world collapsed into a sinkhole.” Now, the journalist provides hope and inspiration for newly diagnosed cancer patients based on her own experiences. When first diagnosed, McDonough realized she had to be as authentic as possible about issues such as her relationships with family, friends and medical providers—and even her thoughts about dying. It’s what she calls “getting real,” a gut-level evaluation of her own belief system she categorized into eight helpful topics for the book. From “getting real with yourself” to “getting real with the treatment process,” the author debunks common cancer myths and offers practical applications for patient self-empowerment. Each section is followed by a “survivor attitude” that highlights how she believes God is involved in a patient’s life. 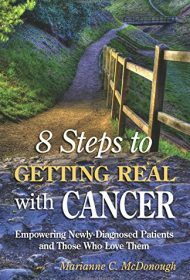 In a compassionate, conversational manner, the author begins with typical misconceptions to avoid: Cancer is a death sentence; patients should always follow advice; emotional and spiritual expressions are a sign of weakness. “Getting real” with medical practitioners focuses on an important issue: It’s not necessary to be the perfect patient. Patients can empower themselves by planning out questions before medical visits, disagreeing appropriately with medical advice and avoiding total dependence on others. She also discusses a patient’s support system, tossing out the preconceived idea that others don’t want to hear about medical issues or don’t want to help. And “getting real with God” has particular meaning to McDonough as she focuses on mortality and ways to grow spiritually. She invites patients to find strength in their own spirituality as they prepare for treatment and survivorship. While the author’s emphasis on Biblical scripture may not be for everyone, many breast cancer patients in the early stages of treatment and those who love them will find McDonough’s thoughtful and practical advice a reassuring look at the breast cancer journey.